The Dodge Challenger was the platform mate to the Plymouth ‘Cuda. While they have similar characteristics, they have quite different styling. The Barracuda was more angular, more aggressive, while the Challenger was slightly curvier and carried a more luxurious stance. While there might be something slightly luxurious about its looks, this car was all performance underneath. The first generation Challenger was built from 1970 through 1974, with 1970 being the peak year for the car. The R/T was only available for ’70 and ’71 and Mopar’s 7.0-liter 426 Hemi V-8 was only available those years as well. 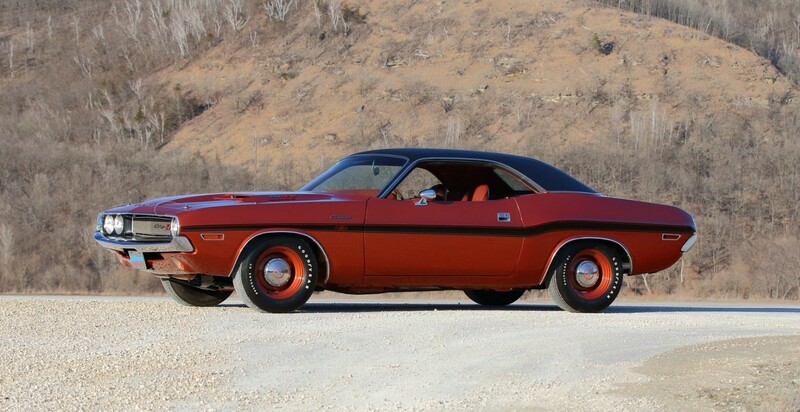 This 425 horsepower beast has an automatic transmission – one of only 150 Hemi automatic Challengers built in 1970. Listed in the Chrysler registry, this well restored R/T Hemi is sort of a sleeper in copper paint. A lot of people like these cars in bright colors and the restrained look here does the car some good. It’s simply one of the best muscle cars, and while it won’t be expensive as the Convertible variant, it will still not be cheap. Click here for more info and here for more from this sale. This entry was posted in Uncategorized and tagged 1970, auctions, cars, challenger, classic cars, coupe, dodge, hemi, mecum, r/t by classiccarweekly. Bookmark the permalink.